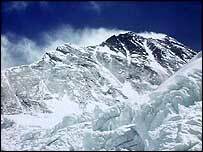 A veteran climber who died while trying to ascend Mount Everest is to be buried on the peak, his wife said. 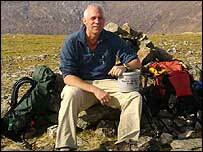 Dr Rob Milne, 49, was 1,200ft short of the summit of the world's highest mountain when he collapsed and died. Speaking at her home in West Lothian, Valerie Milne said her husband's body would remain on the mountain. "I think that's where he would have wanted to stay," she said. "A memorial service is planned." Mrs Milne said her US-born husband had died while fulfilling his lifetime dream. The ascent on Everest was to have been the crowning achievement for the father-of-two, who was a pioneering software expert and entrepreneur. He was aiming to complete the Seven Summits - climbing the highest peaks of the seven continents - and had already conquered six. She said: "It's every climber's ultimate dream to climb Everest. "Robert died at the top, doing what he loved. That brings me some comfort." Mrs Milne said the expedition leader phoned her late on Saturday, about half an hour after the tragedy, to break the news. "He said Robert had suffered a massive heart attack," she said. "This could've been brought on by the high altitude but we're not really sure." Dr Milne was carrying a flag for Aberdeen's Robert Gordon University, which had given him an honorary degree. He had planned to photograph the flag on the summit and have it returned for Monday's official opening ceremony of the university's sports centre by Scotland's First Minister Jack McConnell. But deteriorating weather conditions meant the expedition was two weeks behind schedule. Dr Milne's son Alex said he last spoke to his father on his 21st birthday. He also leaves behind a daughter, Rosemary, 19. Friends and colleagues paid tribute to the academic on Monday. Professor Austin Tate told BBC Radio's Good Morning Scotland programme that Dr Milne had a distinguished career as a scientist, working for a period as the Pentagon's chief scientist on artificial intelligence (AI). He said: "Rob was very well known in all of the communities he played a part in. "I'm part of the academic and scientific work he did on artificial intelligence but he was involved in so many other activities in Scotland - in business, the information technology sector, the mountaineering sector. "He really was one of the strongest people engaged in AI applications throughout Europe. He'd formed a very successful business and had been doing this work for several years." Prof Tate said he has been inundated with phone calls and e-mails from people expressing their sorrow at Dr Milne's death and added: "My feelings go out to Val and family, it's extremely bad news for all of us." Polly Purvis, Executive Director of IT trade body ScotlandIS, said :"To many people Rob Milne was an expert. In the software world he was an international expert on artificial intelligence, one who bridged the divide between academia and the commercial software community with his continued involvement in new research. "In the academic world he was an expert systems practitioner who broke away and set up his own business and proved that whilst it wasn't easy it can be done successfully. "To his staff Rob was an expert fixer, closing the deals, finding ways through the tough times." She added: "To me he was the guy down the corridor at work who gave me advice and support, explained the technologies I didn't understand, helped me get my head round the business finances, gave me advice and fought my corner; the guy who became a friend. "I believe he was a friend to many and many of us will miss him."